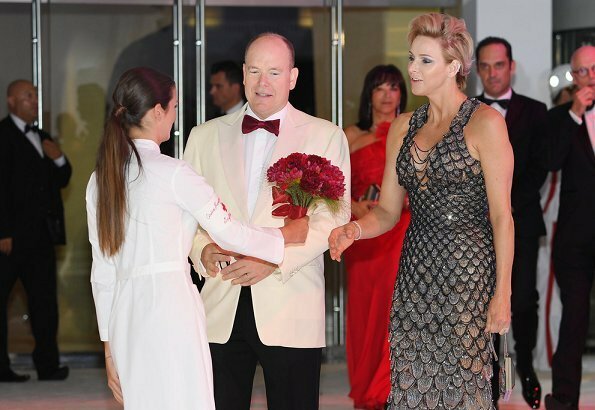 The 70th edition of the Gala of the Red Cross of Monaco, organised to raise funds for the humanitarian organisation, took place in the presence Prince Albert II of Monaco and Princess Charlene of Monaco at the Monte Carlo Sporting Club (Salle des Etoiles) on 27 July, 2018. Every year, the Red Cross of Monaco is presented with a work of art created specially by a renowned artist. For all the money spent on the rose groupings, they could have used to help those in need. Charlene always looks sad, at least her dress is nice for the evening. He just looks like a waiter. On the surface, your comment makes sense but it is short-sighted. To get the people who are able to donate large sums, there must be a spectacular draw in hosts and setting. Those flowers were paid for 1,000 times over with donations. Not a fan of the dress at all. It looks like a badly scaled fish, especially near the bottom. There are some other incongruent features near the neckline that look odd as well. Same with those strands of beads at the top. Charlene has worn much better dresses before. If anything, it is her and her good figure who makes the dress look good. Most probably the flowers and decorations were donated by vendors. This is common practice at charity balls. The businesses get free publicity and good karma. Everyone wins. Charlene's look is very eye-catching. The dress must have required countless hours to construct. I agree - the Princess would look good in anything. Completely agree about the sad looking Princess. The brightness is gone from her beautiful eyes. Of course she looks sad, leading such an artificial life! Great dress looks like fan's or something. I like her hair style and makeup today.Prince Albert looks good and rested again. Both are in great form. Oh Wow! I love her hair! I love her dress! She looks fabulous! Charlene is beautiful. When I saw her, I thought she was a mermaid. Someone got some new parts. She looks fab. I was thinking the same thing Mildred. Charlene is definitely looking a bit fuller in the bust. Her dress is merely pushing up her breasts, the ones she had already! But I must say she looks absolutely stunning. I like her make up very much. Went back and looked at her wedding photographs and I'm not seeing the changes you are talking about. This dress just emphasizes more than most of what she wears. as for expression or sadness, She's always had that expressionless resting face, at least she doesn't look angry like some people do when they aren't concentrating on smiling. The time she was off she was in south africa. No time one cup size Beth. Wonderful. She looks like a Mermaid. The hair colour is more natural. I agree with everyone who wrote that her hair, dress and makeup are gorgeous - and beyond that- she looks regal! She certainly looks stunning. Wouldn´t call her look regal though. 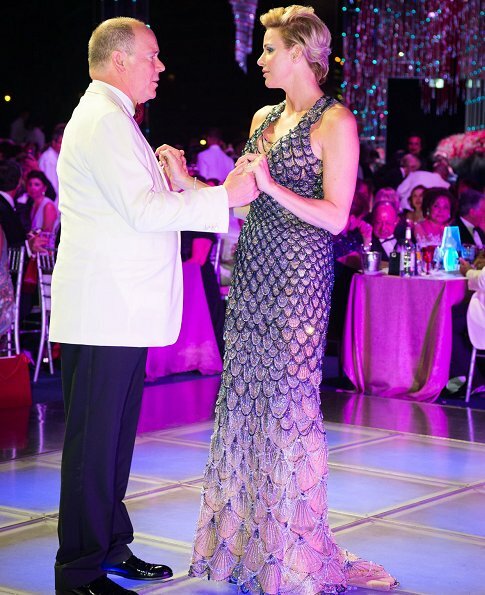 Is Prince Albert and Princess Charlene the only ones there from the family. 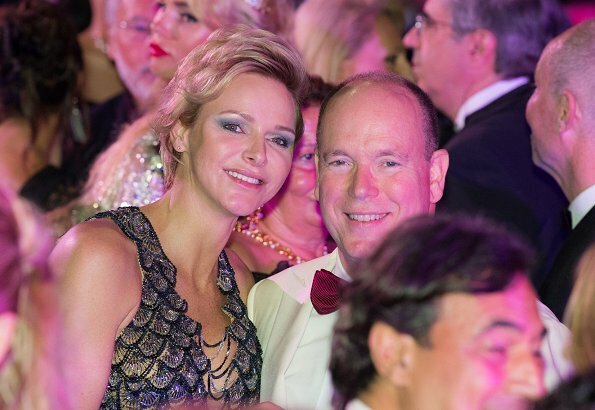 I love this beautiful couple of Prince Albert and Princess Charlene of Monaco. I am very impressed to know about commitments of Prince Albert and Princess Charlene to Red Cross. Hope she has time to spend with her children. I find the dress very Palm Beach gaudy. Her hair looks great but makeup is too Hollywood. As long as she likes it that’s what’s important. Vous m'enlevez les mots de la bouche! J'ajouterais, sublime! Love the dress, lots of intricate detailing. I really like her hair like this and I like the make up and jewellery. Tout est parfait:La robe,la coiffure,les accessoires,Le maquillage. Too much cleavage for a charity related event. The Dress is hideous. She looks like a fish with scales. I agree; not classy. Very Las Vegas. It’s a shame because she’s a lovely woman who looks great in most everything. She is the most stunning royal there is, miles ahead of the rest. I don't like this dress at all, it reminds me of a Disney mermaid, that being said, she looked pretty stunning. I respect the fact that many women are using fillers and procedures to slow aging, and I am in favor of doing whatever makes you feel good, but Charlene doesn't look like her anymore, her face lacks mobility and expression, and IMO she was way more attractive before. Fantastic charity, and that is what fund raising is about, you got to spend a little to get a lot. 1OO% agree that she isn´t looking like her, but there can be differnt reasons. We do not know her, do we? Careful Cherry Blossom, I said the same thing and was attacked on here for being rude. It's plainly obvious Charlene is getting plastic surgery. Also looks like she has recently also gotten breast implants. It's her body and she can do what she wants, but I agree she barely looks like the same person anymore..
Cherry Blossom, I also agree with you - and with Blair. I seems to be a taboo to comment on Charlenes plastic surgery even if it is so obvious. Cherry Blossom, I so agree. I have lived in Monaco for a short period of my life (working for a family) and I can only assume that she felt that she "had" to go with the VERY large flow of women there who are butoxed, filled and trimmed in every possible way. To me it is sad, I hope she feels good. It just doesn t look that way. This evening she is not at her best, I only like the cool ear ring. Anonymous @9:58, actually, we do know....noses don't refine and change shape on their own, cheekbones don't get more pronounced as we age, lips don't become plump and fuller magically, you can google before & after pictures and see the incredible change to her face, and that's OK. I don't think Cherry was being judgmental, nobody condemned her beauty treatments, but just a statement that she liked the old Charlene better, and so do I, personally I have nothing against plastic surgery or enhancements, some look great @ others not so much. A great look for her,she is tall almost anything looks good on her. I love her hair today and makeup. I hope they collected a ton of money for the Red Cross. She looks very pretty! Dress is beautiful. I love the delicate beading across the front and how the pattern spreads out to the hemline. Hair and makeup are great. A lovely picture of a princess!! A truly stunning dress that looks even better in close-up. The deep blue color becomes clear. Charlene loves the water and is always associated with the ocean (her tiara from Albert) so the mermaid effect is brilliant. Her makeup is exquisite. Beautiful! Stunning! The dress reminds me of shells so that ties in with her love of the water. Her makeup and hair also get raves from me! I'm not sure why some people continue to say she always looks sad. She has a calmness about her. It's not sadness. Many people don't have wide open smiles. That doesn't mean they're sad. It looks like a beautiful evening and I'm sure it was a successful evening! 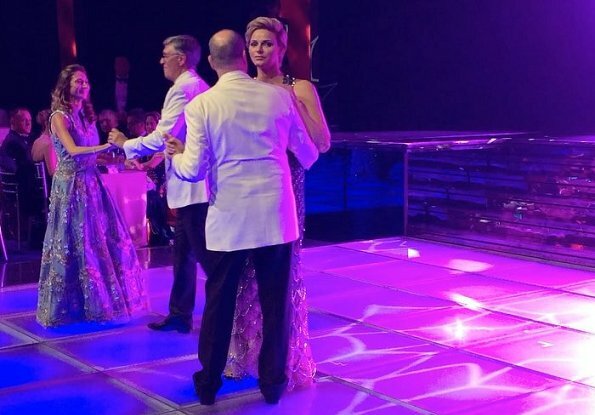 Das Ballkleid der Fürstin ist atemberaubend ! Wo aber sind andere Familienmitglieder der Monegassen ? If it was called the Mermaid Ball instead of the Rose Ball the dress would have been perfect I like her hair but the cleavage is a bit too beauty pagent to be truly elegant. It's not the Rose Ball, it's the Red Cross Gala. A pity we don't get to see the family. Did they attend? ik vind haar prachtig als altijd ,ik hou van dat stel !!!!! ze kan ook wel een de dag niet hebben, waar om moet ze maar lachen !!! ze weten altijd wat !!!! The pattern of the beaded scales is just gorgeous, so intricate and delicate. They must have consumed hours of time and many beads, plus great expense! Who designed this work of art?